Statistics of users, loaded products, sold products, orders. Ability to view more sold products, the last placed,Â productsÂ featuredÂ and the quantity of each product in stock. Unlimited categories withÂ hierarchical levels. You canÂ createÂ categories and sub categories. The possibility to activate unlimited percentage discount or as monetary amount to be applied total order. Browsing and finding orders with filters. Updating the status of the order and inserting any tracking number. Online Registration for the purchase with the possibility of insertion of two different addresses (invoicing / shipping). Once registered you do not need to re-enter their own data to other future orders. 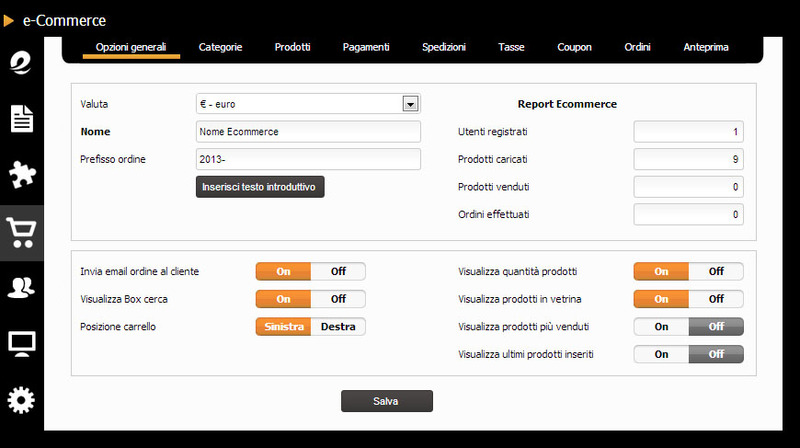 Shopping cart with realtime update, delete, or edit with added products. Ability to enable or disable payment method according toÂ amount of the order. Possibility to add an additional cost for each methodÂ as a percentage (according to theÂ order) or inÂ currency. Ability to enable or disableÂ shipping method according to the total weight of the order. Possibility to add an additional cost for each method. Deciding the currency to use for yourÂ ecommerce (euro, dollar, pound, yen, ruble, swiss franc). Assigning the name to your online shop. Insering a introductoryÂ text to the ecommerce homepageÂ . 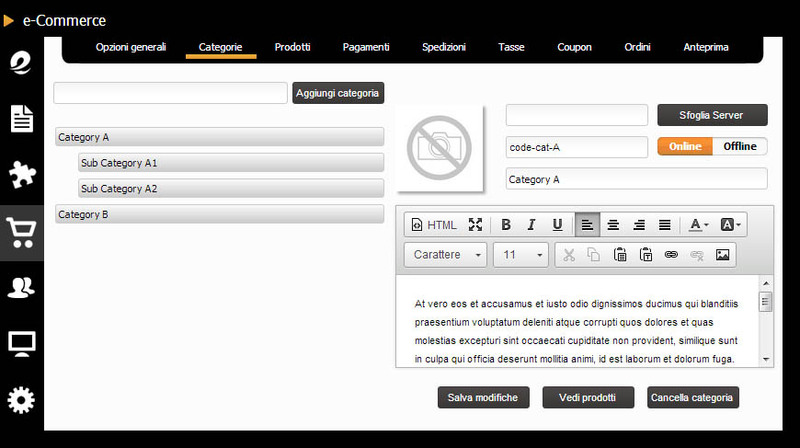 Enabling/disabling the system to automatically send to costumers a purchase orderÂ summery. Enabling/disablig the productsÂ "search" box. Deciding the position of cart button (left or right). Consulting the amount of products in stock (product availability). Showing the featured product on ecommerce homepage. DisplayingÂ the best-selling products and the last (or new in) products. As the image shows, you can create illimitate category and subcategory. You can drag them where you desire (drag & drop). 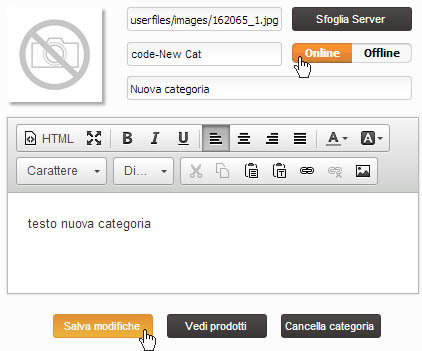 For each category, you can can assign an image, aPer ogni categoria puoi attribuire un'immagine,a code and a name. You can also write a text in witch you describe the products. If you want create a new category, you have toÂ insert the category name and click on "Add category". Once created it, click on the newly created category. After entering the informations, if you want to confirm the category click onÂ "Online" and them on "Save changes". If you want to see the product listÂ you need to click on "View products". 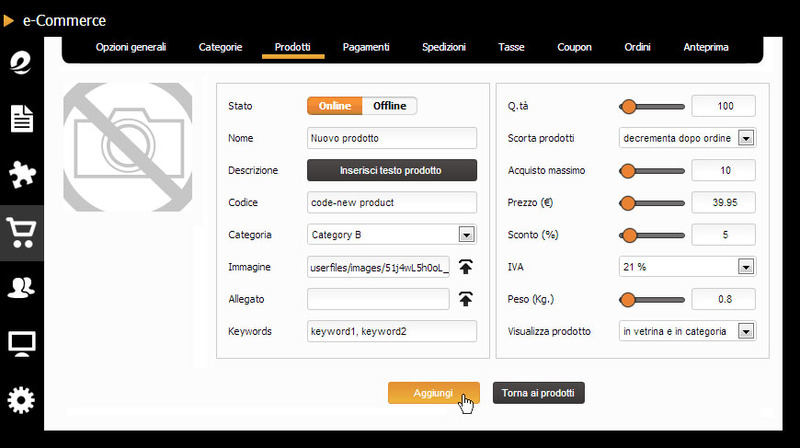 This image shows you how you can display the upload products on your Online shop. If you want to upload a new product, you needÂ to click on "Add bew product". Once clicking it, you will see a screenshot (as in the image below). To add details about product, click on "Add text". To save the data, click on "Add". If you want to modify or delete a product, click on theÂ product name. A screenshoot will appear you. In this panel you can put all info. In this part we are going to see how toÂ manage all payments method. You cannot delete the "PayPal" method. If you not use this option you need to put the "OFFLINE" status. Name (Type the display name of the payment method). Code (Type a code about the payment method). Account (It is extended only to PayPal payment method, so you have to put your Paypal email). 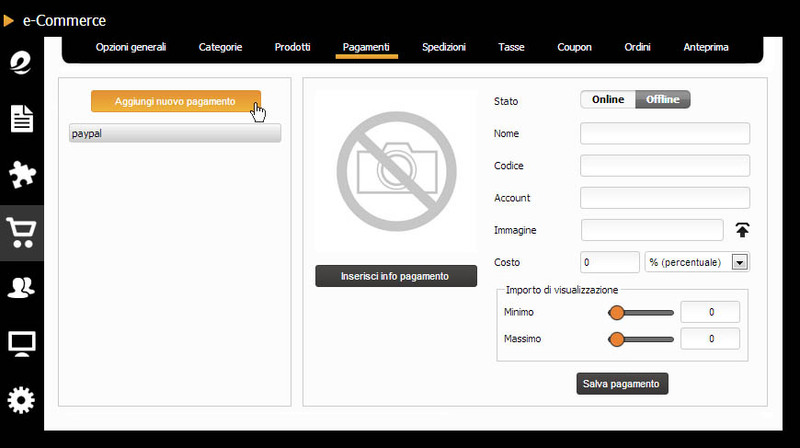 Imagine (Upload an image for each payment method). CostÂ (Insert an addictional cost. You can choose between a fixed cost, for exampleÂ 2â¬, or a cost according to the totalÂ amount of the order). Amount optionÂ (You can choose to limit the useÂ payment method according to the amount of the order with a minimun and maximun range). Payment infoÂ (IWrite a text in witch you explain the payment method. It is appropriate to insert Bank code for "Bank transfer method"). 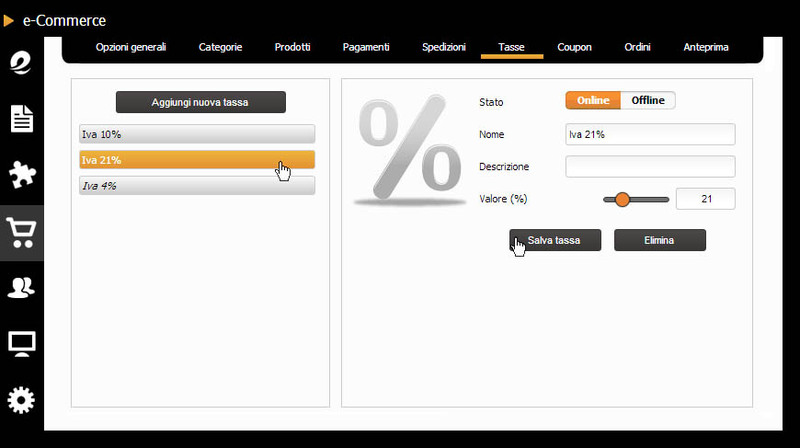 To introduce the payment method you have to click on "Save". If you want to modify or delete any payment method (except Paypal you cannot delete), you need to click on the left list and save changes or delete the payment method. In this part we are going to see how toÂ manage the shippingÂ method. StatusÂ (Switch on or off the shipping method). Name (Set the shipping method name). Code (Introduce your code according to each method). Image (Upload an image to kwon the method). CostÂ (Introduce a supplement to theÂ shipping method). Weight Limits Â (You can decide to controll the use of shipping method according to the order weight. You can fix a maximun and minimun weight). Shipping infoÂ (Write a text in witch you offer details about shipping method. This is useful to give information to the costumer and to communicate any info). Click "save" toÂ confirm the shipping method. If you want to modify or delete any shippingÂ methodÂ you need to click on the left list and save changes or delete the shipping method. StatusÂ (YouÂ decide to use the tax to apply to the products). Name (Set the tax name,Â e.g.Â "Iva 10%"). Description (Enter a shortÂ description). Value (Enter a value from 0 toÂ 100 without theÂ symbolÂ "%"). Click "Save" to confirm the tax. If you want to modify or delete any tax you need to click on the left list and save changes or delete the tax. Status (Change the status of the coupon. Enable/Disable= On/Off). Discount codeÂ (Enter a code. Costumers will apply it before completing the order). Name (Apply a name to your coupon). Description (Enter a short coupon description). Value (Enter the value or the percentage.It will be subtracted from the total). Minimun amountÂ (Enter a minimun amount to use the coupon). Click "save" to enter the coupon.. 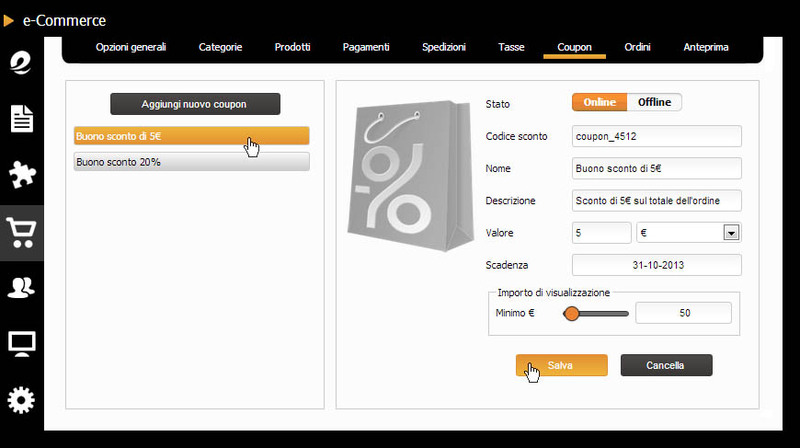 If you want to modify or delete any coupon you need to click on the left list and save changes or delete the coupon/discount. DateÂ (Insert the date of purchase). Code (Show the order code.Â If you click on it you can see order details). Costumer (Show the customer name). Total (Show the amount of order the order. It will RED if customer has not paid yet. GREENÂ se if the customer has paid). 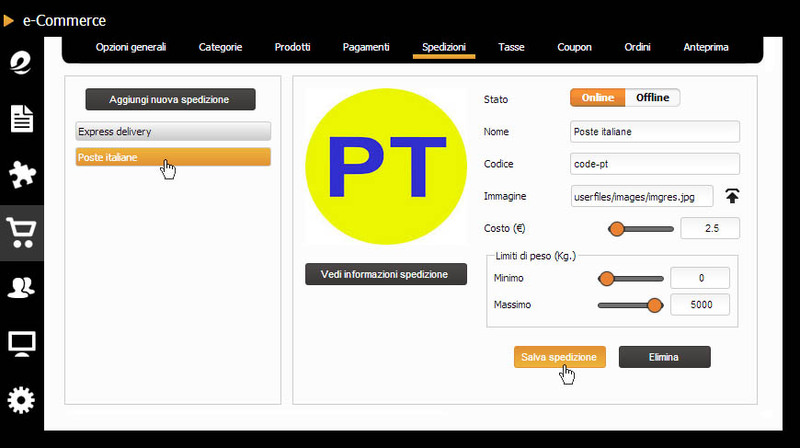 Payment (Show the payment method select by customer). Status (Show the order status:Â in progress, delivered, canceled, refunded, etc.). Icon 1 (After clicking on Icon 1, you can see order details. You can modify its staus). Icona 2 (After clicking on Icon 2 you can print the receipt). If you want more details you need to click on icons or on order code. 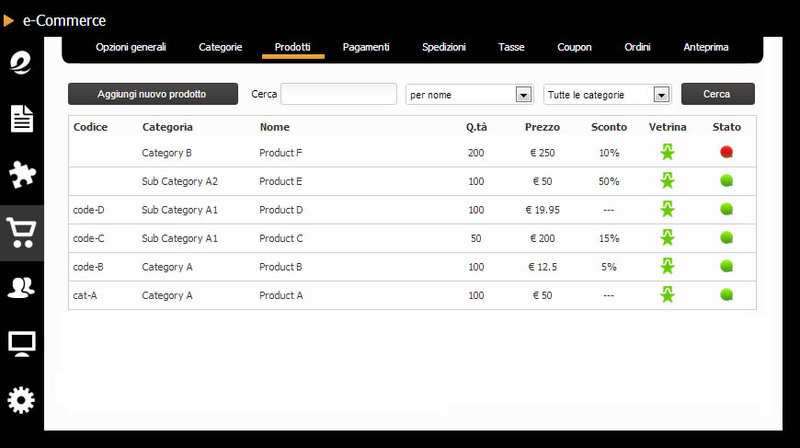 In this tab you can find the info about purchased productsÂ (order code, product name, quantity, price). The order details table desribe the customer name, order number, creation date, last modification, IP custumer, print order and the amount of orders and possible supplements. 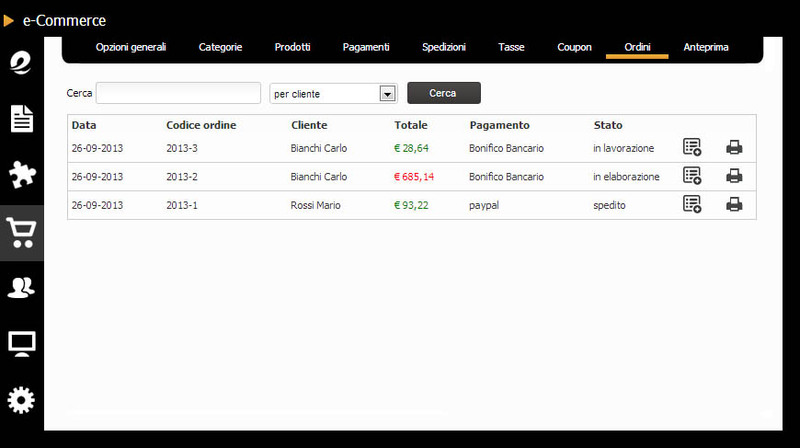 The invoice table contains the customer payment method, invoice address and phone number. The shipping table contains the customer shipping method and shipping address( It can be different from invoice address). Â The Note table contains a text. A customer can write it before confirming the order. It is useful when the customer want to indicate any product charactestic. ProcessingÂ (The order is at initial statusiene creato l'ordine). spendingÂ (It means a preparation status. After there is the products verificationÂ and the if paymentet was confirmed). Payment Failure (The system found problems). DeliveredÂ (Everything in your order has been packaged and correctly send. If the system requests the tracking number, enter it). RefundedÂ (The paymend was refunded to customer owing to imcomplete the order). Cancelled Â (Both customer and seller decide to cancel the order). CompletedÂ (the full order is arrived to destination).